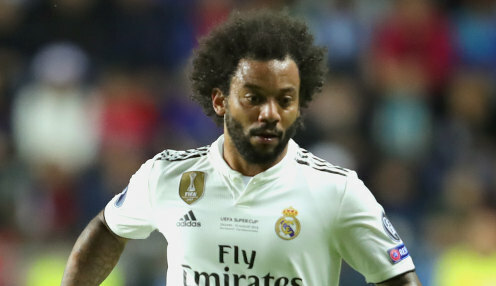 Brazil international Marcelo has indicated that he will spend the rest of his career at Real Madrid even though he is being linked with a transfer to Juventus. Cristiano Ronaldo left last season's Champions League winners and moved to Turin in the summer and reports have suggested Marcelo will be following in the Portugal international's footsteps. The 30-year-old left-back joined Real from Fluminense in 2007 but says he has no intention of leaving the La Liga giants. Real Madrid are 12121/1 to win the Champions League for a fourth campaign in a row in 2018/19 and 2500/1 to land the La Liga title. "It's an element which is hardly worth discussing. I'm very happy at Real Madrid, it's my home and I've got many years left on my contract," Marcelo told Real Madrid TV. "I'm very happy here, it's the best club in the world and I always want to play for the very best. It's good to talk about it because there are always rumours and it's tough for me to have to continually show I want to be here and can play here. I always give it my best to be at the best club in the world. "I want to be at Madrid for many years. I'm very calm about it all and I want to continue at Real Madrid. I'm as hungry as when I was 18 years old. I'll be here until the end."